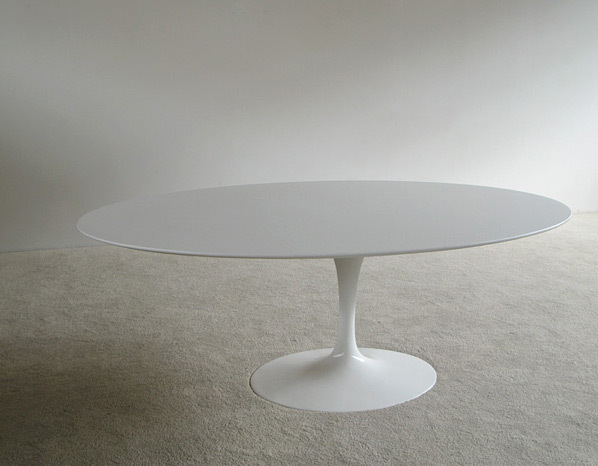 Eero Saarinen white laminate oval dinning table manufactured by Knoll International. Table with clean mid century lines and future look (2001: A Space Odyssey). Oval table with white laminate table top and tulip base, the six La Fonda chairs that are on the pictures that could match together. Table de salle a manger conçu par Eero Saarinen pour Knoll International. Table avec des ligne moderne futuriste (2001: A Space Odyssey). Table ovale avec le dessus de table en stratifié blanc et base tulipe, les six chaises La Fonda qui pourraient être assorti avec la table.